Hey friends! Hope the weekend was a marvelous one for you! Mine was pretty great (and hot) but pretty awesome! I’m so thankful for my family, first off! The fact that we’re so close, makes everything better! One of the most enjoyable things is laughing with them. Laughing and making jokes helps me remember to be joyful in the situation I’m in right now. 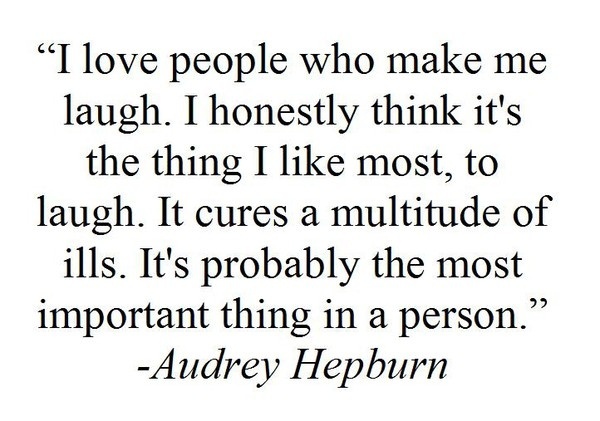 Audrey Hepburn seriously has some of my favorite quotes, but this one, so true! Alright, let’s get this started! And big thank you to Katie from Healthy Diva Eats, for hosting! Toasted Blueberry Kashi Waffles with greek yogurt fluff on top and a little maple syrup! One of my favorite ways to fuel before a long run! Running 8 miles with my dad in unfamiliar places all over our city!! We crazy! My favorite brand of chips, Late July, and GUACAMOLE! Yeah, baby! That stuff is good! Post-long run dinner! Sauteed beets, beans, rotisserie chicken, and squash from our garden. Half way through cooking the squash, we decided we didn’t want just sauteed squash, but fried squash. It happens! Fresh salad greens from the garden, bell peppers, baked artichokes, chickpeas, and feta cheese! Passion quotes! I believe passion is what drives me…what about you? What’s your favorite Quest Bar flavor!? So much MARVELOUS! My weekend was fantastic. Lots of friend time and “me time.” My favorite QuestBar is Chocolate Chip. Favorite quote: “If you love what you do, you’ll never work a day in your life.”- Confucius ❤ Cheers to a great week, love! The chocolate chip one is definitely amazing! Let me know when you get your package from Quest! Also, that quote is so true! I just think it’s so awesome you & your Dad run together. I mean forreal, he must be in rocking shape! Big props to him 🙂 haha! May I ask how you make your greek yogurt fluff? He’s like the bomb. He’s 50 and can run a half marathon in like 1:33. His fastest 5k was last summer and he was like 6 seconds from getting under 20 minutes. He’s my inspiration every day! Greek yogurt fluff: 1/4-1/3 cup if plain nonfat greek yogurt (don’t usually measure it), sweeten with stevia, add 1-2 tbsp of coconut flour (usually I start out with 1 tbsp because I don’t want it dry thick, but I want it fluffy thick.) Then I either add 1/2 tbsp of PB or almond butter! Sometimes ill add cinnamon! That is so awesome that you can go on runs with your dad! I wish my dad could still keep up. Sauteed beets are a must try! I was wondering what was on top of your Kashi waffles in the Instagram pic! How do you make this Greek yogurt fluff? I love the cookies n’ cream and apple pie Quest bars the best -who am I kidding – I love them all! Cookies and creme is also one of my faves! I love Audrey Hepburn – she was such a class act. My favorite Quest bars are cookies n’ cream and raspberry white chocolate. They totally cute my sweet tooth! Audrey Hepburn is just so awesome! LOVE the cookies n creme! Mmm all that food looks good! 🙂 I’ve never tried the peanut butter supreme quest bar! How does it compare to the other flavors? I’ve only tried the brownie one and the cinnamon roll one! Brownie one is my like fave!!!! But the PB supreme is perfection. Its got little pieces of peanuts in it but not too much. So its the right amount of crunch. Its got a superb PB flavor as well. Love it! I hate failed eggs! That quest bar looks so good- but my favourite is the cookie dough….seriously, never had a bar which tastes like it’s namesake!